Bass Fishing Patterns - What Patterns Can Tell You Where To Find Largemouth? What Are Largemouth Bass Fishing Patterns? "repetitious bass behaviors during a specific period of time, be it hours, a day or several days, throughout a specific body of water". "Seasonal patterns", wherein bass tend to engage in certain instinctive behaviors at certain times of the year, triggered by changes in water temperature and number of daylight hours, are the broadest bass fishing patterns. These are the "major" movements bass make during a year. Spring finds largemouth bass moving into shallow coves, onto flats and around points. Summer heat drive bass to deeper water. They move to offshore structure and deeper into the main channel. Fall days shorten, water cools and bass move shallow again into the creeks where they were found in the spring. Winter's short days and cold temperatures call bass back to the depths. The seasonal patterns of change, though not exact and varying from region to region, are good starting points for locating bass. Within them there are other patterns, patterns within patterns if you will. Identifying them and then applying the best lures and techniques to catch them is "pattern fishing". In this article let's look first at the what natural forces influence the movements and locations of largemouth. These are the foundation of bass fishing patterns. Where Do You Start? How About Temperature? Remember, a bass is a bass no matter where it may live. It's wired by nature to behave according to the ever changing cues in its habitat that drive it to seek food, procreate or quite simply, survive. These cues usually turn on water temperature and length of day. Seasonal changes in water temperature and daylight hours do trigger predictable instinctual behaviors in bass. However, daily and weekly changes to daylight, current, water depth, wind, barometric pressure, inflow of fresh water from spring rains, water clarity, degree of dissolved oxygen and changes in bottom substrate within the seasonal trends makes identifying a "pattern" to fish difficult even for the pros. Largemouth, Water Temperature and Survival Further complicating the identification a "pattern" based solely on water temperature is the fact that largemouth bass can function quite well in water between just above freezing to a high of 98° with the "sweet spot" being between 65-85°. This presents a wide latitude for bass movement. Nevertheless, the single most significant influence on the movement and behavior of bass is probably "water temperature". Why? Because a bass' body temperature is determined by the temperature of the water around it. It can control its body temperature only by moving to a different area of water where the temperature is more to its liking. Furthermore water temperature contributes greatly to initiation of spawning activity. So for the angler, water temperature is indeed important in identifying bass fishing patterns for bass but it must be taken into consideration within the context of the season, weather conditions, water clarity and even the length and time of day, all of which influence largemouth behavior/location. The primary influence on largemouth bass movement is the coming and going of the four seasons, each of which comprise roughly three months. Of course these seasons beginnings, durations and ends are not the same everywhere. Winters are longer and usually harsher in the northern states while summer has a longer duration the farther south one goes. Temperature Happens, When It Happens! No exact dates can be pointed to as the day(s) when water temperature in any body of water will reach that magical degree that triggers the beginning and end of spawn. Temperature and length of daylight combined do so and predicting this "alignment" is next to impossible. Furthermore, not all bass move shallow or spawn simultaneously as different parts of a lake warm at different times regardless of daylight duration. Florida may see largemouth finished spawning while in Tennessee they're in pre-spawn and in Wisconsin they're still hunkered down in their cold water haunts. Take a look at the map below. 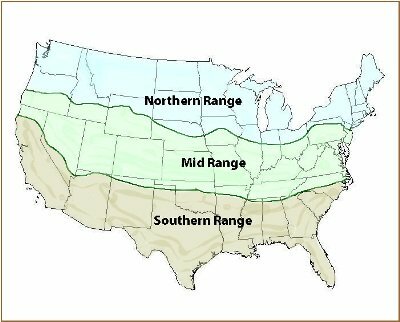 The three colored areas indicate general seasonal areas. Within each, the nature of a body of water, largemouth instincts, the impact of seasonal changes in daylight hours and the ever changing seasonal variations in weather on a body of water function to determine when and where largemouth can be found. Exactly when these changes occur in each region, be it Spring, spawn or Fall, will be different. However, the order in which these changes occur in each region will always be the same. The same applies to bass fishing patterns in the regions. Spring movement centers around the urge to spawn and so will spring bass fishing patterns. Longer periods of daylight, from around 12 hours in March to 14 hours in May, triggers the instinct that pulls bass toward their spawning grounds. Pre-Spawn, which begins when water temperature reaches into the upper 40's, finds bass moving near to spawning grounds but still mostly in deeper water. Remember, deeper is relative depending on the nature of the water body. Look for them on shallow flats just outside river and creek channels in man-made lakes. In natural lakes they'll be in shallow bays, especially those filled with grass/weeds. In rivers they will move to weedy sloughs, grass or stump fields. As the water warms into the 50's they will begin feeding heavily. Spawn for largemouth usually occurs in water 1-4' deep when the water temperature reaches 60° or so. The behavior of largemouth bass during the stages of spawn is a very defined bass fishing pattern. Especially to "bed fishermen". Note, however, that the key trigger for spawning is length of day and temperature together. If a few warmer than normal days occur early and warms the water into the 60's sooner than normal this will not induce spawning if daylight hours are not "right". Post-Spawn begins roughly when the water reaches 70°. As temperature continues its downward trend to cold water, largemouth resume feeding as they slowly make their way out to deeper water (remember, deep is relevant) where they will ultimately reside during the heat of summer. During this transition period, after a week or so of "lockjaw" recovering from spawn, they will routinely move from deep to shallow water to feed then back deep. They are hungry and anxious to "refuel". This can be a time of plenty for largemouth anglers. Look for them to be holding close to the first area outside the spawning bed which has easy access to deep water, like a ledge. They can be commonly found in 15'-20' of water. Summer time is hot weather fishing time. The sun is high in the sky. Daylight in June and July is 15 hours long. With this combination comes heat and warmer water which nudges bass out of the shallows. Initially they will be scattered and suspended but eventually will school to chase baitfish. Shallow Water warms up quickest sending bass deeper where they often form schools around deep structure like rock-piles, humps and saddles. Some will move shallow to feed during cooler times of the day, early morning and evening. Anglers that enjoy night fishing can do quite well summer evenings. Deep Water is where largemouth bass go on "summer holiday" in reservoirs to avoid the reduced oxygen levels of hot, shallow water. Those that are adept at fishing deep water structure can score big. Note that in northern "natural lakes" largemouth don't find it necessary to retreat to deep water as they do farther south in deeper reservoirs. The abundance of aquatic vegetation provides ample oxygen in shallow areas of natural lakes throughout the summer. Note that the larger, older bass haunt the depths of reservoirs in summer, really year round. This bass fishing pattern finds the big girls and guys hanging on humps, rock piles and long deep points. Fall cold fronts and shorter days begin cooling the water of lakes and rivers causing bass to again become active. Fall bass fishing patterns center on largemouth moving to main lake humps, points and to shallows looking to feed on shad moving into coves and creek arms. Early Fall is considered by most anglers, depending on where they're located, as September or early October. Whenever cooling autumn weather begins to cool down water surface temperature from the 80's slowly to the 60's. Bass will still be holding in their summer refuges but will be actively traveling along migration routes back and forth between deep and shallow water. Mid Fall is viewed by some as the second half of October through November. Certainly in the Southeastern states this is the case. Water temperatures are in the 60's and 50's respectively and the daylight hours are fewer, about 10 hours. A great bass fishing pattern happens at this time when largemouth will be enthusiastically pursuing shad onto flats and into the back reaches of creeks and coves. They will be hang out next to almost any type cover, even a single stickup, to ambush passing schools of shad. Late Fall finds water temperatures in the 50's and 40's. Water can be quite murky from both water inflow from rains as well as "lake turnover". Largemouth will be found in shallow areas closest to their migration routes as they slowly move toward their winter haunts. Look for them in the backs of creeks as these areas often provide them both shallow and deep water in relatively small areas close to their migration routes. Winter bass fishing finds cold air, cold water and fewer daylight hours, no more than 10. Largemouth seek the warmest, most stable water they can find. This usually means deep (again, remember depth is relative to the body of water you're fishing) where they become sluggish and feeding is intermittent with long periods between meals. Why? Because the metabolism of a largemouth bass slows markedly in winter and it may take a week or more to digest a good size meal. Shallow water in the cold of winter holds few bass. It's that simple. Deep water is where the bass are in winter. Look at depths between 15' and 30'. Winter bass fishing patterns revolve around vertical surfaces. Here the bass fishing pattern is one where bass hold deep along bluffs, deep creek channels, ditches and even standing submerged trees. There are two primary seasonal movements where bass move in mass and engage in the most recognized bass fishing patterns. One is the spring migration from deep water to shallow to satisfy natures call to reproduce. The other is from deep water in the late summer, early fall to shallow in order to feed. The latter happens because of the instinctive urge to "fill up" reserves needed to help survive the winter months. An important aspect of these "seasonal movements" and the bass fishing patterns within them is the fact that largemouth make them by moving back and forth between shallow and deep water via "migratory routes", not greatly different than many wild game animals. These migratory moves will most always relate to routes along "edges" and rarely exceed more than a quarter mile distance. Edges Are To Bass What Pubs Are To Beer Drinkers Ecologists describe edges in nature as places where two or more different habitats merge. These places hold special attraction for both aquatic and terrestrial creatures. They offer more of everything a largemouth bass likes, cover, food, structure, ambush locations and safety. What comprises an edge? Tree lines, fence rows, stumps, sunken roads, bluff walls, grass, rock piles, points, stream channels, drop-offs or even a sunken bass boat, ouch! Largemouth make other movements, less predictable and irregular, that center on finding food or more hospitable water in terms of temperature and dissolved oxygen. As bass fishing patterns these movements are short in duration as well as distance. They are temporary movements confined within their "home range" and they occur along defined paths, such as old roadbeds, tree lines or twisting, turning river channels. If you can identify the routes of these short feeding excursions and check them several times a day (during warm water periods) you can score big. Just keep in mind that they won't last longer than two hours, often less. In cold water periods they will be fewer in number and duration, 30 minutes or so.